I should probably apologize in advance because if you don't already have these polishes... you're definitely going to want at least one (if not ALL) of them. These are my first Cult Nails polishes, and I can tell you they will not be my last. 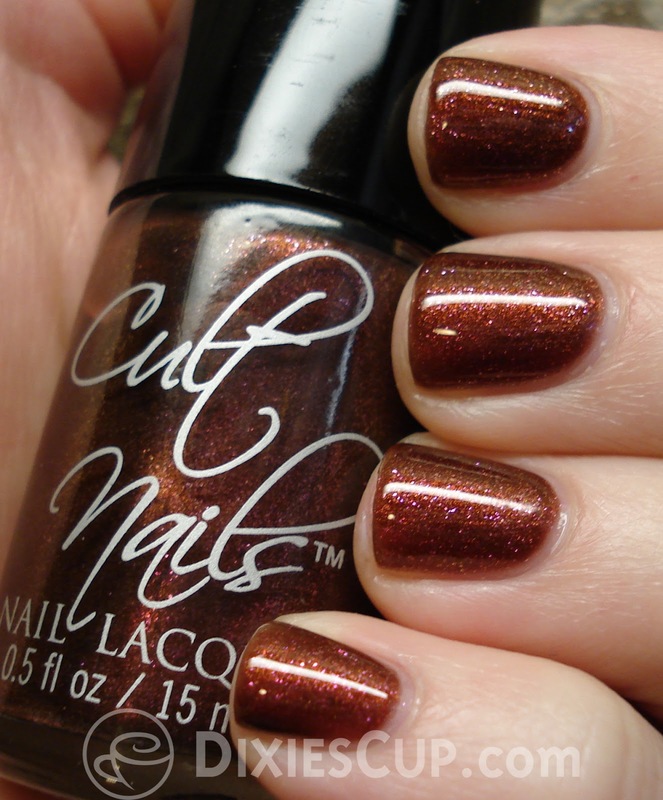 Cult Nails is owned and run by a really awesome lady in Florida named Maria. 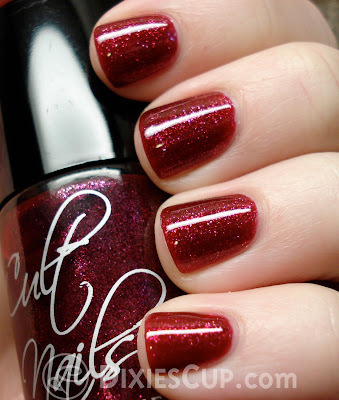 For now her polishes are only available online at www.CultNails.com, but she is working on getting her brand into stores. I think it is only a matter of time. I need to stop blabbing and get on with the good stuff! Without further ado... 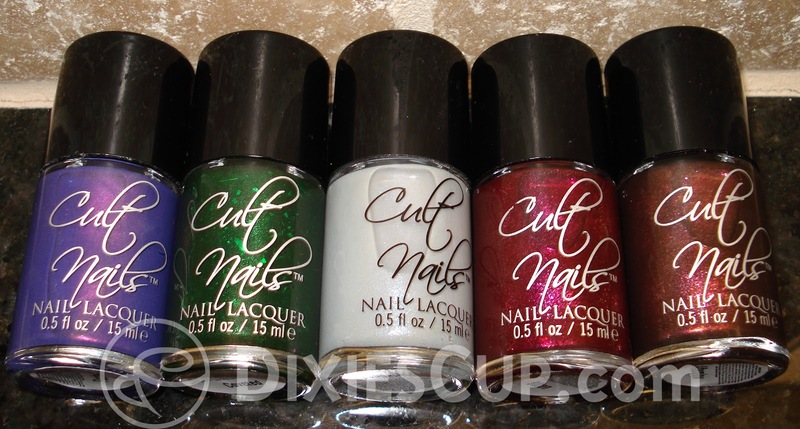 The Cult Nails Behind Closed Doors Collection! I have to admit... when I purchased this set, Afterglow was the polish I was the least excited about. I love brown, but I felt like I already had this color. Until I put it on my nails!!!! Look at that. Just look at it! It is this lovely coppery-brown laced with little flecks of magenta/pink shimmer. I think it is extremely unique. Bitten was another color that I was a little "meh" about when I saw it in the bottle. I am SOOO glad I didn't pass it up. It is the prettiest shade of raspberry red mixed with a bunch of pink, magenta, and purple flecks. I love it a lot. Ohhhhhh Disciplined! It is such a pain to photograph... but I think I did well enough that you get the point. I am a HUGE fan of gray, so naturally this was one of the colors I couldn't wait to wear. The fact that it had a bunch of purple, pink, and blue shimmer was icing on the cake. It's soooo soft and pretty! This swatch has no base coat, 3 coats of color, and a coat of top coat. Coveted is one of the most unique polishes I've ever purchased. My favorite color is green, so naturally this is one of my favorites. It is a really awesome deep forest green jelly with green shimmer and big metallic green shards of glitter. There is so much to look at and admire! 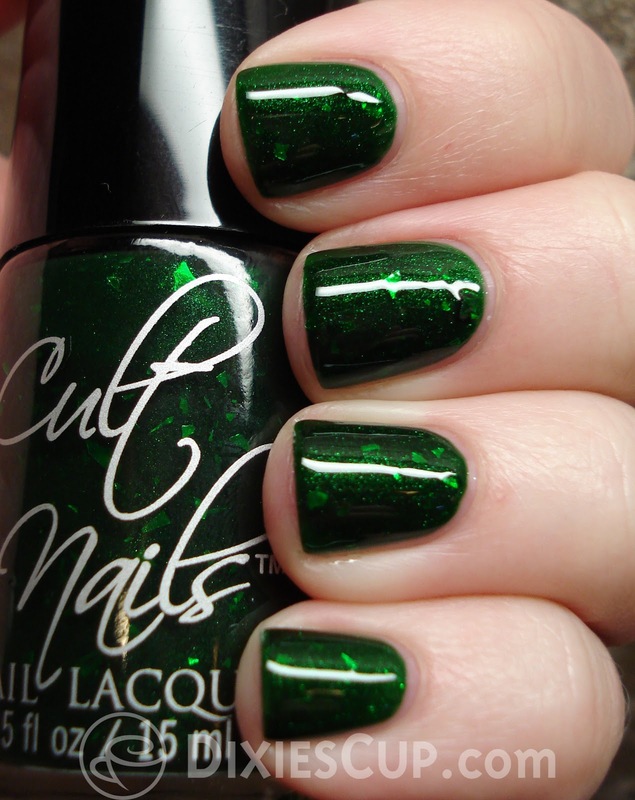 Unlike some glitter polishes, there is no fishing around in the bottle to get a sufficient amount of sparkle on your nails. 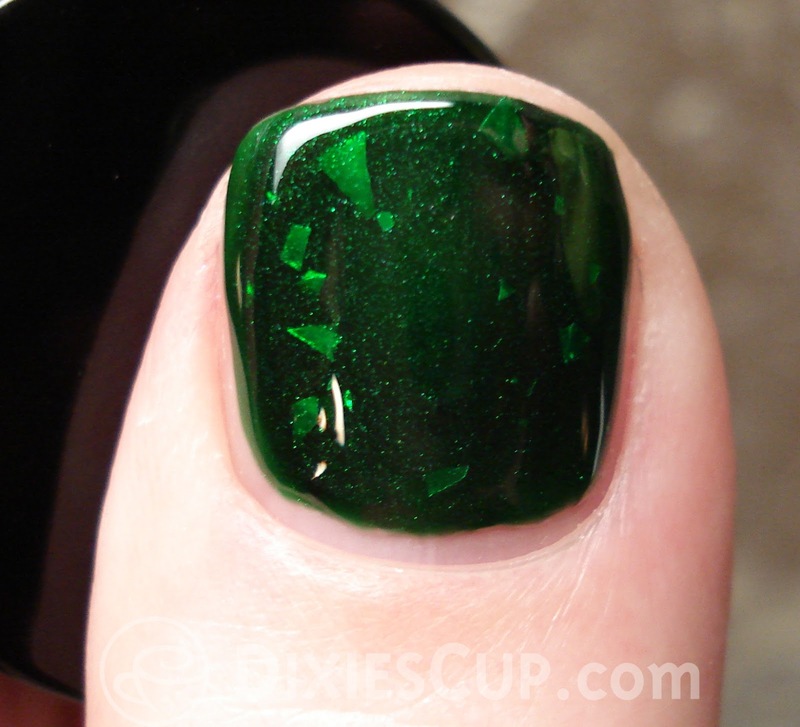 Pictured in the photos is base coat, 2 coats of color, and top coat. Love. Last but not least... FLUSHED! 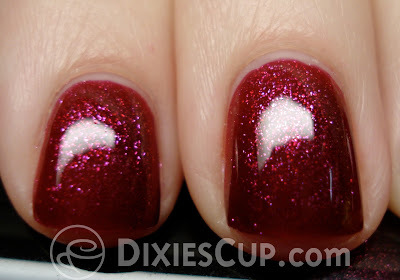 This one was the first polish in the collection that caught my eye. I'm not typically drawn to purples and pinks so much, but I really really really like this one. The description on the website says "Flushed is a true 'Blurple' (blue/purple) buildable sheer with an intense purple/pink shimmer effect that appears to glow through the polish." I couldn't say it better myself, so I just borrowed the whole description! This polish is kinda magical. Thanks for reading, I hope you enjoyed looking at these as much as I did.